One of the world’s most sought-after and highly recognizable fish is the koi. 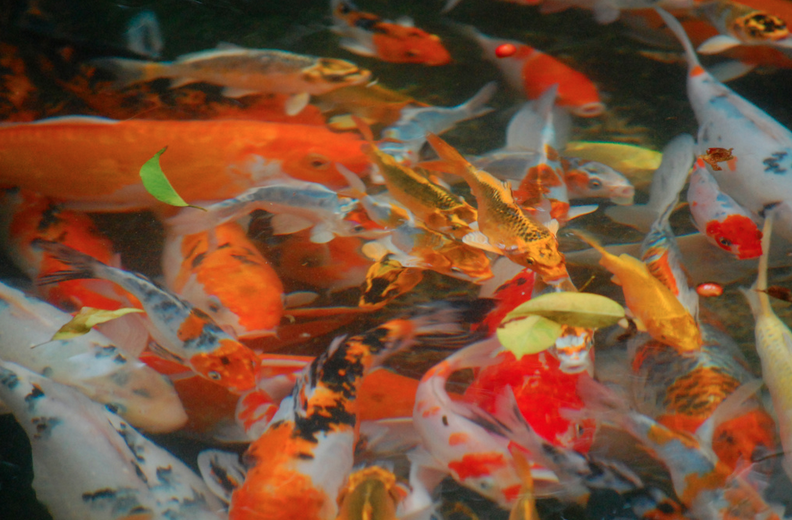 Because of their huge array of bright and vibrant colors, these fish make any pond come alive. Their colors and patterns, while beautiful, can also signify their variety. According to the Zen Nippon Airinkai, an international koi-keeping foundation, there are currently 15 recognized varieties of koi. Koi fish come in a variety of colors, though you’ll see red, black, white, blue, and yellow most frequently. The beautifully colored koi we know and love today did not always look the way they do now. Koi were originally cultivated by Japanese koi breeders in the 1800s. By carefully tracking hues in carp and breeding over the generations, the Japanese introduced its cousin – the koi – to the world. The much-loved koi of today are now recognized in 15 groupings, though these groupings encompass multitudes of koi in each one. There are many ways of grouping koi. These fish are organized by their single varieties, their color variations, and a combination of both as well. Out of the 15 groups of koi, the Kawarimono is the largest simply because it umbrellas so many varieties and variations of koi. Some serious koi keepers believe that Gosanke, a collective of Kohaku, Sanke, and Showa, are the only koi of real value. These koi typically have red and white markings. A Kohaku and a Showa koi side by side. Kohaku is another koi under the Gosanke branch. These koi were first genetically mutated from black carp in the early 1800s. This variety is known for its ideal skin quality and red and white pattern. Sanke koi, which are oftentimes seen as a favorite amongst koi breeders, boast three colors – red, white, and black. This variety began in Tokyo in the early 1900s. Sanke and Kohaku koi can oftentimes be confused in their early years as coloring and patterns develop and change. Out of the Gosanke koi, Showa were developed most recently in the 1920s. At a glance, Showa look similar to Sanke koi in their tricolor pigmentation. However, Showa koi have a black base with red and white markings, as opposed to the Sanke koi, which is a white background with red and black markings. While color can be used to classify koi, it can also be used as a tool for determining your koi’s health. A sick koi’s coloration will dull or even appear to have a tint of grey. And while a koi’s coloration will be enhanced with some natural sunlight, excessive exposure will cause sunburn. Sunburn can lead to discoloration in a koi. To avoid sunburn, provide shade for your pond with foliage and pond plants. Kohaku koi are red and white, while Sanke and Showa are both red, white, and black. When purchasing koi, keep in mind that their colors will change over time. This transformation is called ontogenetic color change. Ontogenetic color change will specifically alter the intensity of a koi’s pigmentation. It can sometimes affect a koi’s patterns too. You can also play a hand in your koi’s coloration by providing them with color-specific diets. This fish food is packed with supplements, such as carotene and spirulina, and is recommended once daily. Color-enhancing supplements specifically affect red pigmentation, making the hue deeper and more vibrant, though it can also affect white pigmentation, adding pinkish tones. Share the beautiful koi fish colors in your pond with other koi connoisseurs! Send us a picture via the contact form!